BB pellets imbedded in her back! OMG, this poor girl! Her family dumps her, pregnant at the animal shelter, she’s covered in deep cuts, bleeding, can’t stand up… they claim their large dog attacked her, and then x-rays show she has BB pellets in her back!! Her story starts here, with UPDATES BELOW! If you have already read this part please scroll down to UPDATES. Her injuries include laceration, pulmonary contusions, dislocated elbow, possible broken bones. 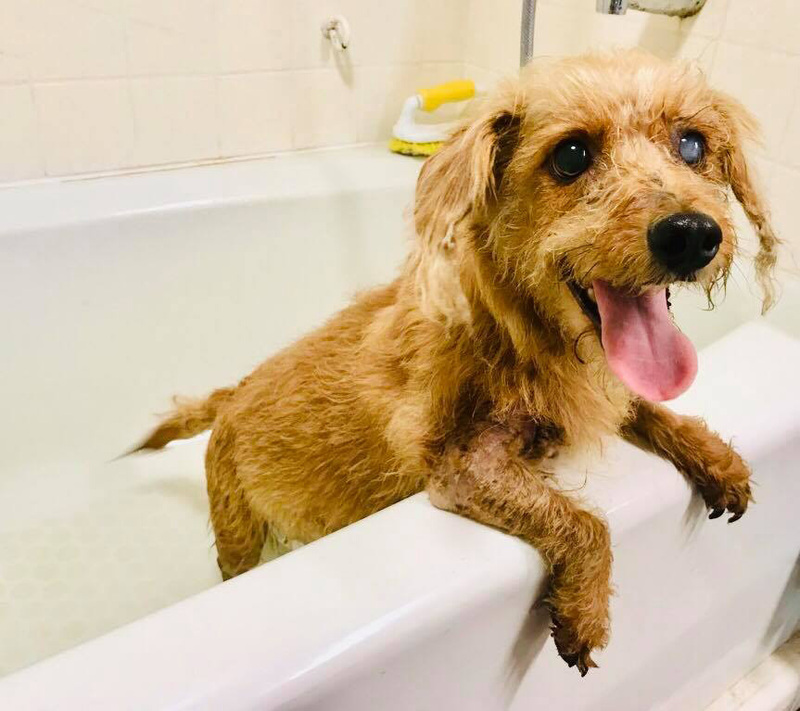 She has been rescued by Animal Foundation of America, April 8th, and is going straight to the vet. We will update the fundraiser amount when we have a specific estimate. 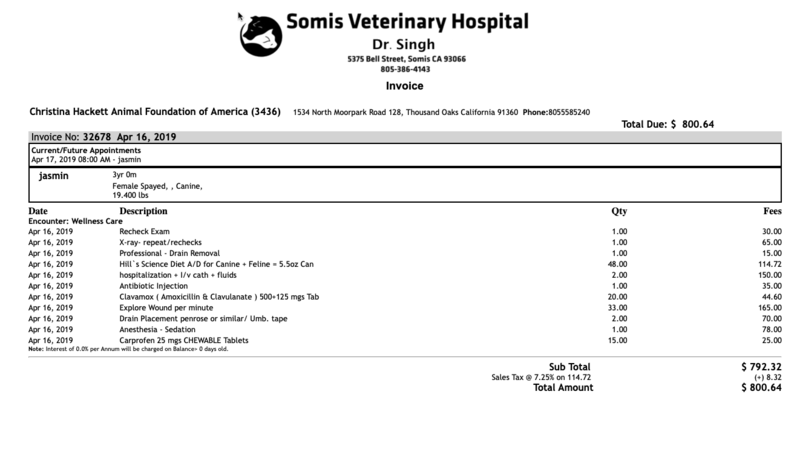 All donations are only for Jasmine and will only be paid to the rescue and vet! Thank you for considering a donation. Please watch the videos, they tell the story. PLEASE SHARE! WOOOOF! This story has taken an amazing turn! There is good news, sad news, and amazing news. Good news is that Jasmine is doing very well. 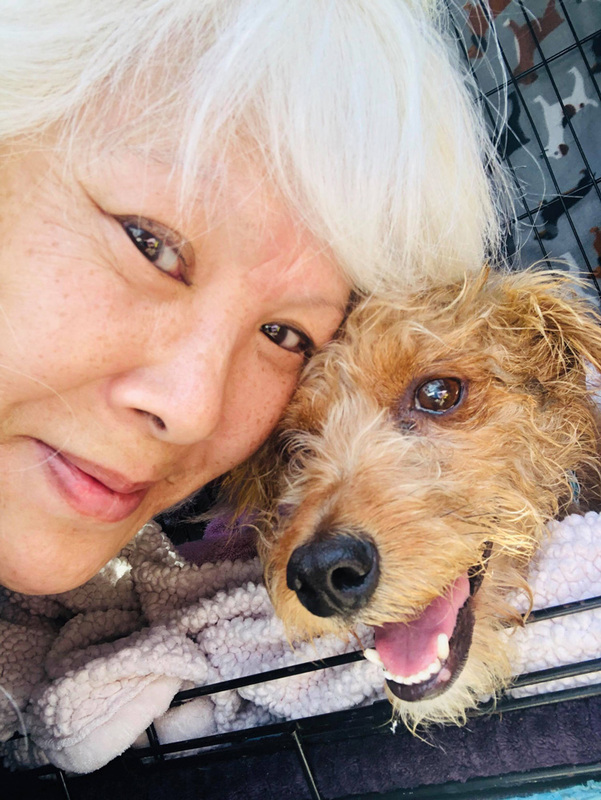 Christina of Animal Foundation of America is fostering her, and she took Jasmine for her first check up over the weekend. Her drain tube has been removed, and she appears infection free. She has multiple BBs inside her still, but it is stable. There will be a surgery to remove some or all of them in the future, but for now it is OK. 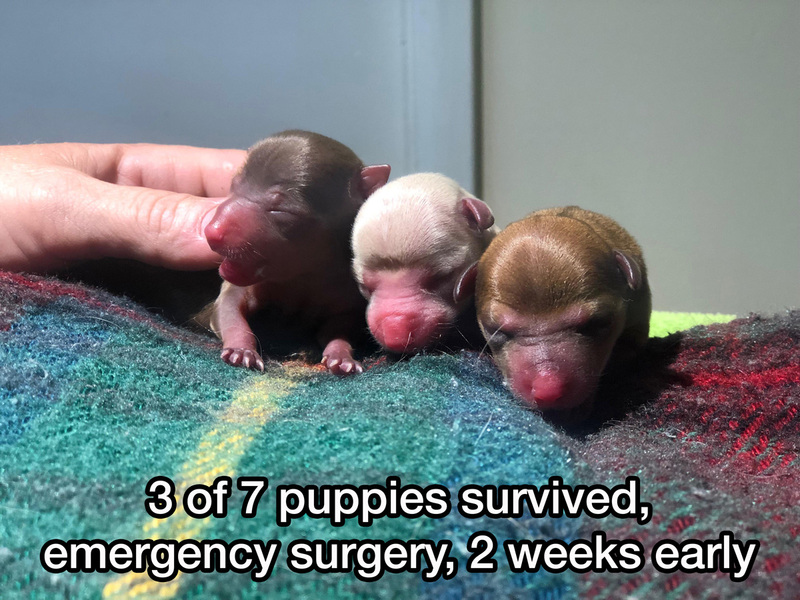 Sad news is that all three surviving puppies passed away. They were simple “born” too early, and could not survive. One died shortly after being removed, the other two, which we had been hopeful for were discovered dead on Sunday, April 14th. 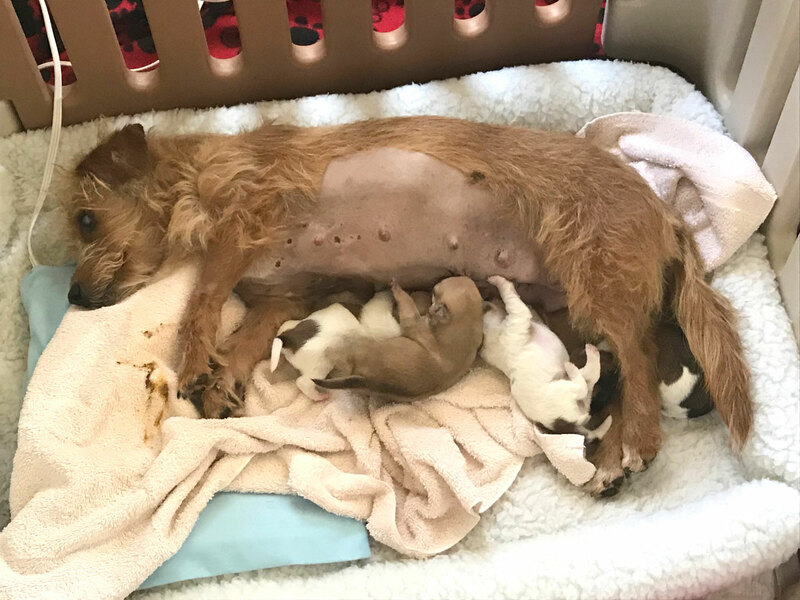 Jasmine’s milk has come in and she was nursing, but now there are now puppies. Jasmine had seven puppies. She required immediate emergency surgery. The procedure was tough, and she almost died. The doctor who did the surgery was so upset and overwhelmed that he canceled the rest of his day after the procedure and went home. Her abuse was significant. 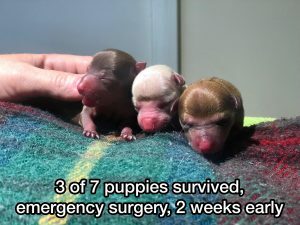 There were seven puppies, one was still-born on the way to the vet, three were dead in her uterus, BUT THREE SURVIVED! They are 2-3 weeks premature, and their prognosis is guarded. Here is a video of one of them, followed by a group photo. We are very hopeful on them! 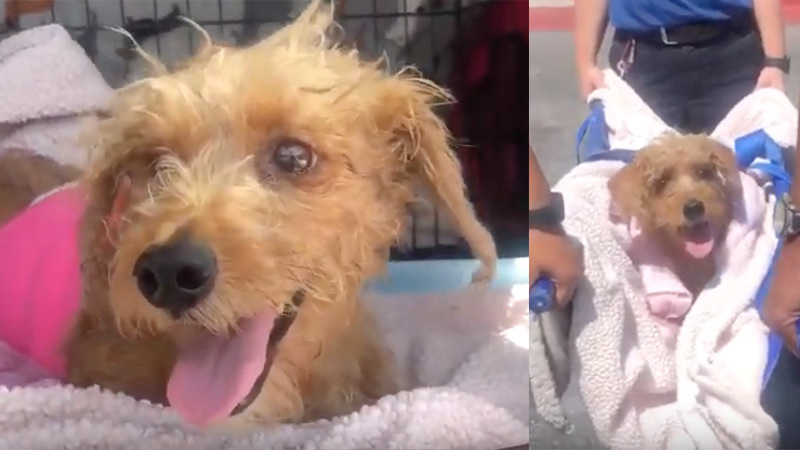 We are not giving all the details of her case right now as we have been informed by LA County Animal Control that there is now a serious investigation underway. Jasmine’s case has been elevated to the highest level within Animal Control. She was in severe pain, and was clearly purposefully hurt. She is much happier today (April 10th)! 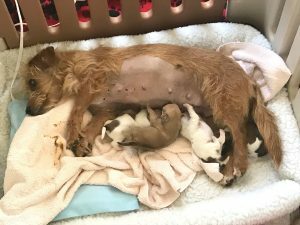 She is running around, happy face… and she has accepted her surviving puppies and cleaned them, and is caring for them. We will keep you posted on her case as it develops. Follow us on Facebook and on Instagram! Thank you for assisting…. we understand not everyone can donate right now, but SHARING helps a lot too! WOOF!! Heart broken for Jasmine. Thank you. Praying for a miracle for this precious girl. May she recover in body, mind and spirit and have a wonderful home for the rest of her life. Thank you for helping this sweet girl. This sweet baby deserves a chance. Thank you for your love for the animals. I hope this beautiful girl finds her forever home with people who can love her and treat her the way she deserves. Helping Jasmine because you do so much for these babies! She has been heavy on my heart since I found out about her story how devastating it was that she endured it all and still smiles and has hope and strength! Praying for a full recovery Jasmine! With so much love, teño and lily bean. Jasmine, I’m so sorry someone did this to you. I’m glad you were able to find good people to help you and your puppies. I’m praying for all of you. Please continue getting better and take good care of your little ones. I’m praying for you brave mom and pups. I also the find and punish the person or person’s that did this. God Bless all the good people who rescue everyday. And the wonderful doctor’s and staff. Thank you for taking care of this sweet creature who had the misfortune to be owned by ignorant, pathetic humans. Thank you for helping sweet Jasmine. Good luck girl. God bless!!! I am giving a bit back for the help you gave me for my Cotton a few years ago. Great full for you guys helping animals!! I pray that her story gets out and the offenders have to pay for this severe cruelty! hope she is doing better. where is she . is she been adopted yet. It’s disgusting that anyone could do this to any living being, let alone a pregnant one. Thank you for rescuing her and taking care of her. It’s disgusting th…at anyone could do this to any living being, let alone a pregnant one. Thank you for rescuing her and taking care of her. hope she is doing be…tter. where is she . is she been adopted yet. 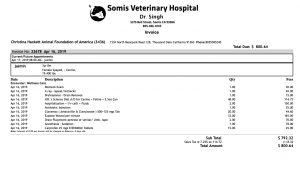 I pray that her stor…y gets out and the offenders have to pay for this severe cruelty! Good luck girl. God …bless!!! I hope this beautifu…l girl finds her forever home with people who can love her and treat her the way she deserves.